Rebekah helps Jacob receive Isaac's blessing. Rebekah (Rebecca or Rivkah—רִבְקָה—"Captivating") was the wife of the patriarch Isaac and mother of Jacob and Esau in the Bible. She was the daughter of Bethuel and the granddaughter of Nahor, Abraham's brother. She was also the sister of Laban, who later become the father-in-law of Jacob. Rebekah was instrumental in Jacob's winning, by deception, the blessing of his father Isaac. She also wisely saved Jacob from the wrath of his brother Esau, by advising Jacob to flee to her brother Laban when Esau sought Jacob's death. In rabbinical tradition, she is considered a prophetess and a woman of great virtue. In Christian tradition, she is one of the ancestors of Jesus. In Unificationism, Rebekah is seen as a providential model, having succeeded where Eve had failed, in protecting her younger son and enabling him to fulfill his mission. 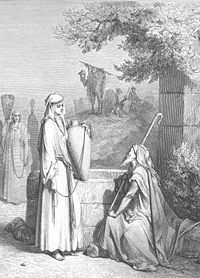 Rebekah meets Abraham's servant Eliezer at the well of Nahor. May it be that when I say to a girl, "Please let down your jar that I may have a drink," and she says, "Drink, and I'll water your camels too"—let her be the one you have chosen for your servant Isaac (Genesis 24:14). Rebekah responds perfectly, proving to Eliezer that he has found a bride worthy of Isaac. She also happens to be a member of Abraham's clan, the daughter of his nephew Bethuel. Eliezer gives her rich gifts of jewelry and clothing and asks for hospitality from her family. Rebekah accepts the gifts, allowing Eliezer to place a gold ring in her nose and bracelets on her arms. She then goes to inform her family of his request. the gates of their enemies (Genesis 24:60). After the long journey back to Canaan—Isaac is then living in the Negev—Rebekah first glimpses him from afar, as he stands in the field praying. She immediately dismounts from her camel and modestly covers her face with a veil. The two immediately take to each other. Isaac marries her, honoring her by bringing her into his mother, Sarah's, tent. The Bible adds, significantly, that "he loved her" (Gen. 24:67). Despite Isaac's affection, like several other important biblical women, Rebekah remains infertile for many years. Finally, after 20 years of marriage, Isaac's prayers are answered when she conceives. However, her pregnancy is exceeding difficult due to the child(ren) struggling in her womb. She travels to an unspecified place to inquire of God to discover, "why this is happening to me" (Gen. 25:21). She is told that she is bearing twins who represent opposing nations, and that "the elder shall serve the younger" (Genesis 25:23). At the birth, the first child to emerge from the womb is ruddy and hairy. He is named Esau. The second child emerges grasping his brother's heel, as if to pull him back and assert his own right to be born first. He is named Jacob. As the twins grow up, their differences become apparent. Jacob becomes "a dweller in tents" (a herdsman and also one who follows the family tradition) and Esau becomes "a man of the fields" (probably a farmer), but also an avid hunter who roams far from the family dwellings. Rebekah favors Jacob, while Isaac's favorite is Esau. When a famine strikes Canaan, Rebekah follows Isaac to the land of Gerar. Fearing he will be killed on Rebekah's account, Isaac tells the Philistines who live there that his beautiful Rebekah is actually his sister. Much like her predecessor, Sarah, the wife of Abraham, Rebekah acts the part of a single woman, "for a long time." One day, however, the king, Abimelech, looks down through his window and sees Isaac making love to Rebekah (Genesis 26:8). He chastises Isaac for his deception, saying, "One of the men might well have slept with your wife, and you would have brought guilt upon us." Abimelech then provides Isaac with legal protection so that Rebekah and Isaac may live openly as husband and wife. The couple prospers immensely, and Isaac becomes rich with herds and slaves. It is not clear whether Esau and Jacob are with them at this point, since the twins are adults and are not mentioned. Eventually, Isaac becomes so powerful that the Philistines grow dangerously envious, and Abimelech orders the couple to leave. They travel to Beersheba, where they settle and later make a treaty of peace with Abimelech. At this point, Esau, being 40 years of age, marries. Rebekah and Issac, however, are very displeased with his choice, for he marries two Hittite women instead of following his parents' example and marrying within the clan (Gen. 26:34). Nevertheless, when Isaac is old and blind, he decides to bestow his blessing on Esau. He sends Esau out to the field to kill and cook for him a piece of savory game, before blessing him. Rebekah overhears this exchange and, believing that Jacob is more deserving of the blessing, conspires with Jacob to obtain the blessing by deception. When Jacob fears Isaac's curse, she declares herself fully responsible for any guilt, saying: "My son, let the curse fall on me. Just do what I say." She commands him to bring her two goats from the flock, and she then cooks them in the way Isaac likes. To protect Jacob from being discovered, Rebekah lays goatskins on his arms and neck to simulate Esau's hairy skin, and dresses Jacob in Esau's clothes. Jacob then goes in to his father and succeeds in receiving his blessing. When Esau returns and the plot is uncovered, Isaac nevertheless refuses to withdraw his blessing from Jacob. Because Isaac had previously purchased Esau's birthright from him, Esau feels not only cheated but virtually disinherited. He vows in his heart to kill Jacob. 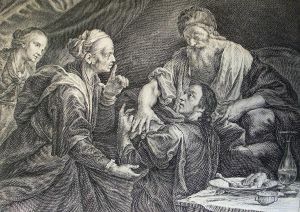 Rebekah prophetically perceives his murderous intentions and orders Jacob to travel to her brother Laban's house until Esau's anger subsides. She also influences Isaac to cooperate in this plan, by telling him that she despairs of Jacob's marrying a non-Hebrew girl, as Esau did (Gen 27:46). 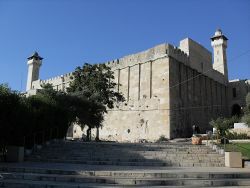 The Tomb of the Patriarchs, traditional resting place of Rebekah and several other ancient Jewish ancestors. Rebekah's death is not recorded in the Bible. She is not present, and may already be dead, when Jacob returns 21 years later, to reconcile with Esau. However a brief note declares that Deborah, Rebekah's nurse, had died near Bethel just before Jacob's homecoming (Genesis 35:8). On the other hand, Jacob and Esau are both present at the burial of Isaac. 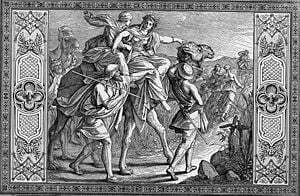 Some believe Rebekah simply died while Jacob was in exile in Haran, during a period in which the narrative does not deal with events back in Canaan. Others believe she survived and was reunited with Jacob. Genesis 49:30 states that her remains were (eventually) buried at the Cave of Machpelah, near Mamre, along with several other patriarchs and matriarchs. A cave traditionally identified as the Tomb of the Patriarchs still exists in the West Bank town of Hebron. Rebekah sees Isaac for the first time. Rabbinical tradition adds much to the biblical record of Rebekah, although, as is often the case, the rabbis disagree with one another. As to the age of Rebekah at the time of her marriage to Isaac, a tradition exists that Abraham was informed of Rebekah's birth around the time of his intended sacrifice of Isaac. Some affirm that this would make her only three years old at the time of her marriage to Isaac (Seder 'Olam Rabbah 1; Gen. R. (57:1). However, alternative manuscripts of the Seder 'Olam Rabbah insist she was 14 years old at her marriage. And the Sefer ha-Yashar gives Rebekah's age as 10 years. Rebekah joined Isaac's prayer to God for a child, which was offered while they lay prostrate on the ground facing each other. The scripture refers to Isaac's prayer alone being answered (Gen. 25:21) because his entire family was righteous, while Rebekah's was wicked (Yeb. 64a; Gen. R. 63:5). The evil Bethuel, Rebekah's father, even tried to poison Eliezer when the latter sought to procure Rebekah as Isaac's wife. During her difficult pregnancy, Rebekah went from door to door, asking the women whether they had ever experienced anything like the tumult in her own womb. Rabbi Eleazar ben Simcon declares her answer came directly from God. Rabbi Hama ben Hanina says that God spoke through an angel, and Rabbi Eleazar ben Pedat opines that the answer was delivered through Shem, the son of Noah, into whose scholarly house Rebekah had come to inquire (Gen. R. 63: 6-8). Another tradition declares that Rebekah originally should have given birth to 12 sons—the fathers of the 12 tribes—but after the birth of Esau she became barren again (Pesik. 3:23b; Gen. R. 63:6-7). Rebekah was a prophetess, and this is why she knew that Esau intended to slay Jacob (Sotah 13a; Gen. R. 62:9). Several sources put Rebekah's age was 133 years when she died (Sifre, Deut. 357; Midr. Tadshe; Sefer ha-Yashar: section "Wayishlah"). Some say her death occurred while Jacob was on his way back to his parents' home from Haran. Some authorities declare that Esau was present at her burial, and the ceremony was performed at night out of shame that a wicked son such as Esau attended her coffin (Pesil. 50:c. Midr. Agadah on Gen. 50c.). However, according to the Book of Jubilees (31:8-11, 48), Rebekah was still alive when Jacob returned home. She journeyed with him to Bethel and died at the age of 155, five years before Isaac's death. Consideration of J's Jacob as a literary character should commence with his mother, the formidable Rebecca. Unlike Sarai and Rachel, Rebecca has no rivals; she is Isaac's only wife. As J represents her, Rebecca could tolerate no such sharings. She altogether effaces poor Isaac… She exhibits a will that rivals Tamar's, a will unafraid to usurp the Blessing (Bloom, 2005. p. 210-11). A number of biblical critics take the view that Rebekah and Isaac, though possibly historical figures, were not the lineal parents of Jacob and the Israelites. Rather, the great patriarchs and matriarchs may have been the ancestral leaders of several Canaanite tribes, who later federated into the nation of Israel (Dever 2003). In this theory, the story of lineal descent serves more to strengthen the sense of kinship among the Israelites than to preserve an accurate genealogical record. Hirsch, Emil G. and M. Seligsohn, 1901-1906. Rebekah. The Jewish Encyclopedia. This page was last modified on 27 June 2015, at 22:41.